The day began early with the crowing of a couple of roosters outside on the street. Thinking the sun must be about to rise I thought it would be a good time to get up and capture some photos of the sunrise over the rise paddies. As I sat up fumbling for my gear I thought i’d grab my phone just to check exactly what time it was. 2:30am! The bloody roosters had started at 2:30 in the morning and would continue their piercing chorus until 7am. As I and the rest of the room laid there holding pillows over our head to try and drown out the noise I pondered imagined fantasised about finding a gun and shooting the damn bird. Eventually about 5:30am came around and I gave in and got up and went for a walk around the town. Clearly a rough night. At least there was coffee and an abundance of bananas for breakfast. 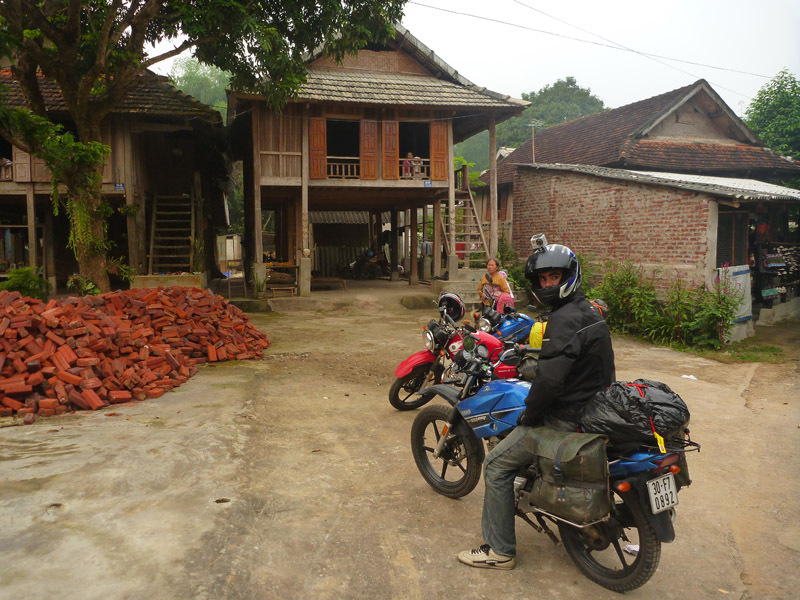 Having all woken up so early we had packed the bikes and were ready to go by 6:30. Our friendly lodge owner however refused to let us pay and leave until we had breakfast. 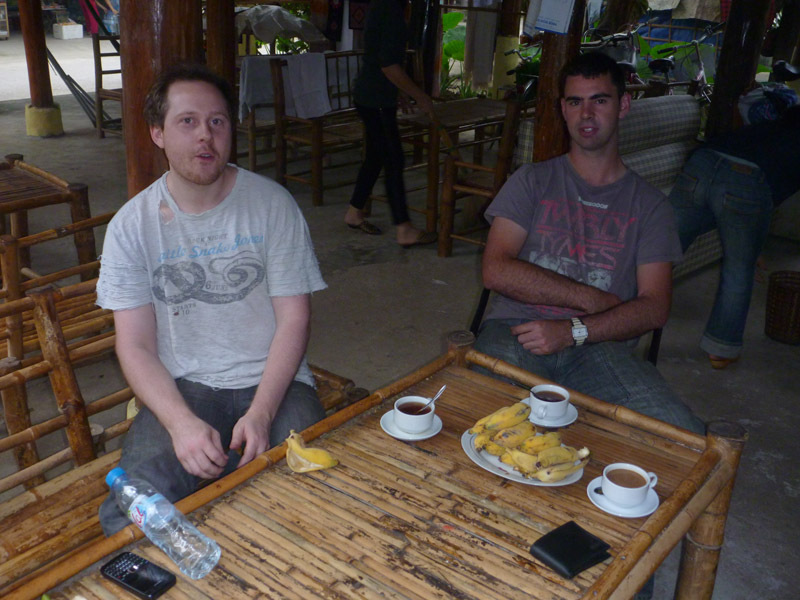 We were brought coffee, bread and a plate of bananas that would have cost a weeks wages back home ($16/kg at the time for those not from Aus). After demolishing them we settled the bill, a whole $30 for three of us for accommodation, dinner, beer and breakfast, and were on our way. 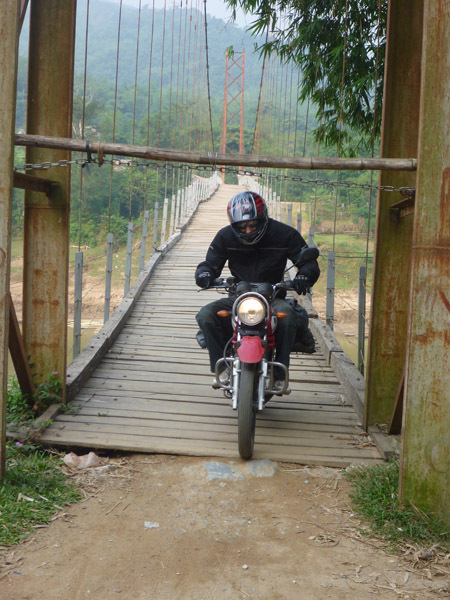 The first 100 odd kilometres out of Mai Chau on Hwy 15 really tested out the definition of a highway. For the most part it was just a single lane road and 90% of the time it was covered in dirt, clay or sand making for some real testing riding. I managed to get the bike crossed up a couple of times dodging trucks on the soft and ever changing surface but thankfully nothing more. 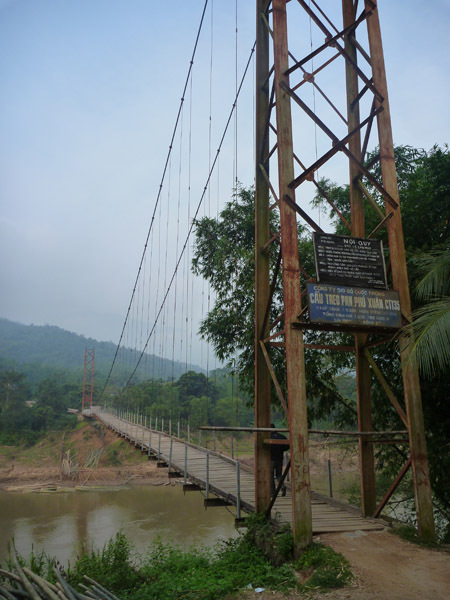 An old suspension bridge across the river. Built at a cost of 1.38billion Dong and completed in 2001. It was apparently strong enough for the locals to ride across but I figured with the bigger bikes and all our gear it was best not to go the whole way across. I couldn’t resist giving it a go. The wooden bar at the end was clearly designed for the much smaller Vietnamese locals. For a 6’6″ guy on a large bike it was the perfect height to take my head off. 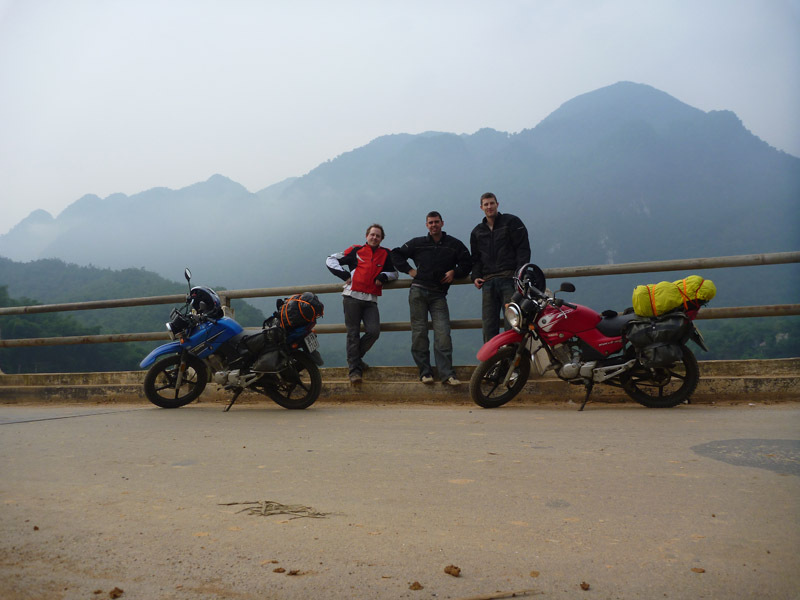 Another stop at a bridge coming down from the mountains. Note the mud all over the road. This was indicative of what we’d been riding on all morning. Ultimately a very slick surface for our small wheels. 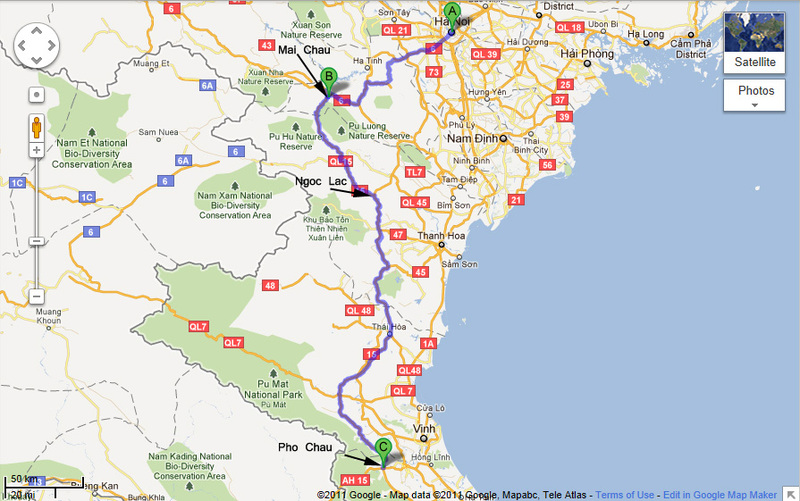 After slow riding all morning (averaged about 30km/hour) we stopped in Ngoc Lac for an early lunch of Pho Bo. It was our first of what would be come a daily meal for us. 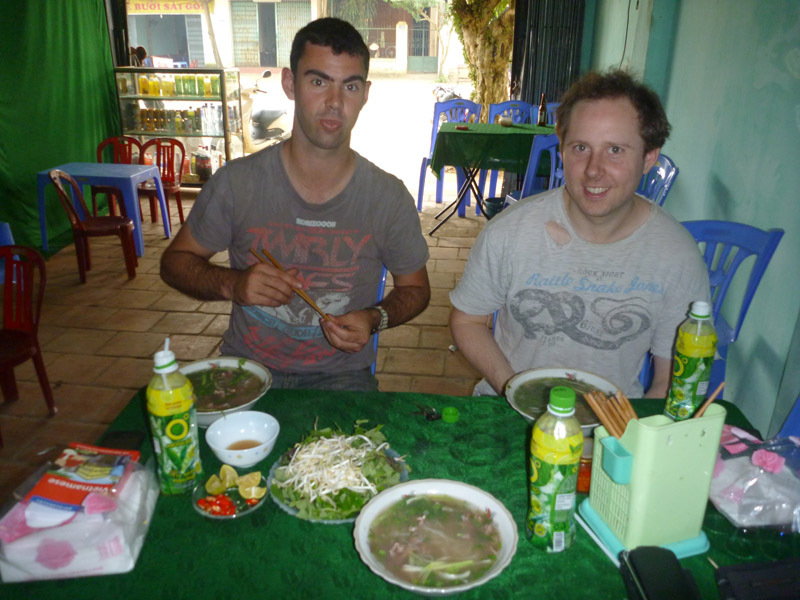 While it might sound a little boring having Vietnamese beef noodle soup for lunch every day, the ways it was cooked and served varied so much over the length of the trip that it was always interesting to compare. 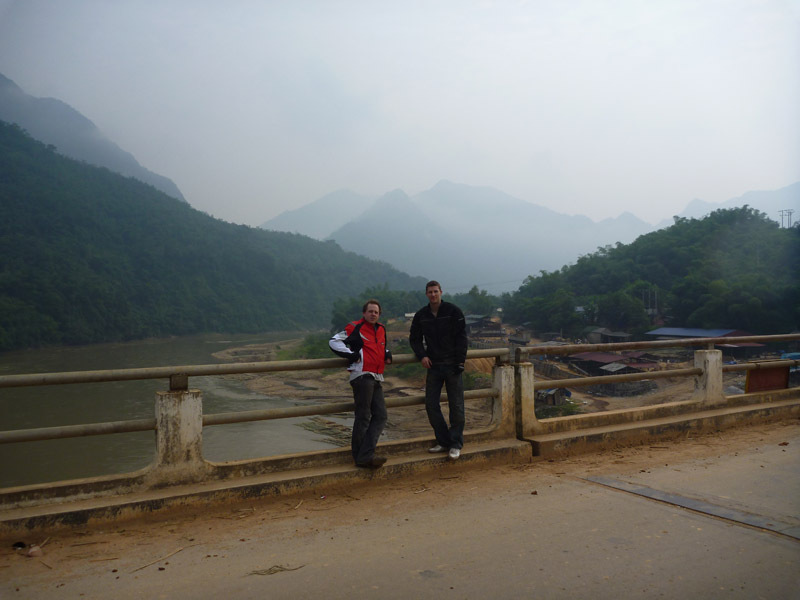 This one in Ngoc Lac was probably the freshest we had all trip and got a few votes for best of the trip. The herbs, bean sprouts and chilli’s were all freshly picked and the stock was just delicious. 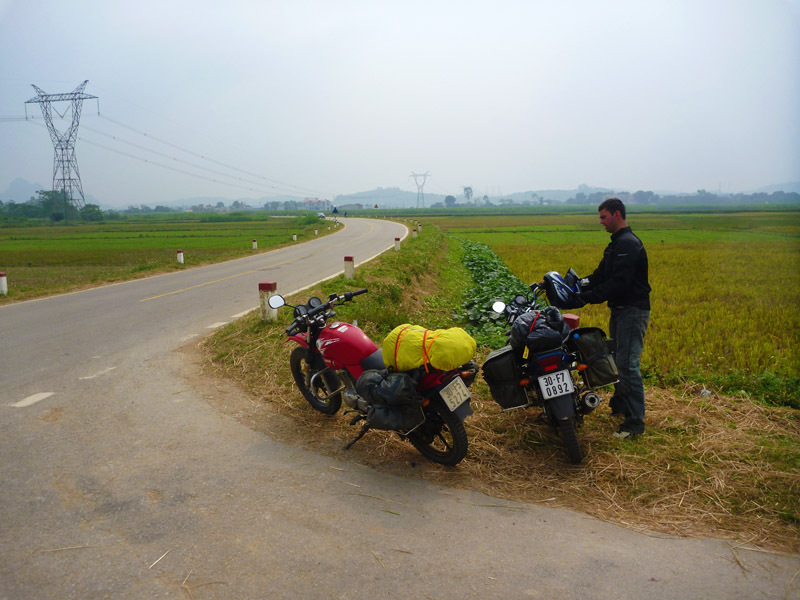 Real “highway” heading south of Ngoc Lac. 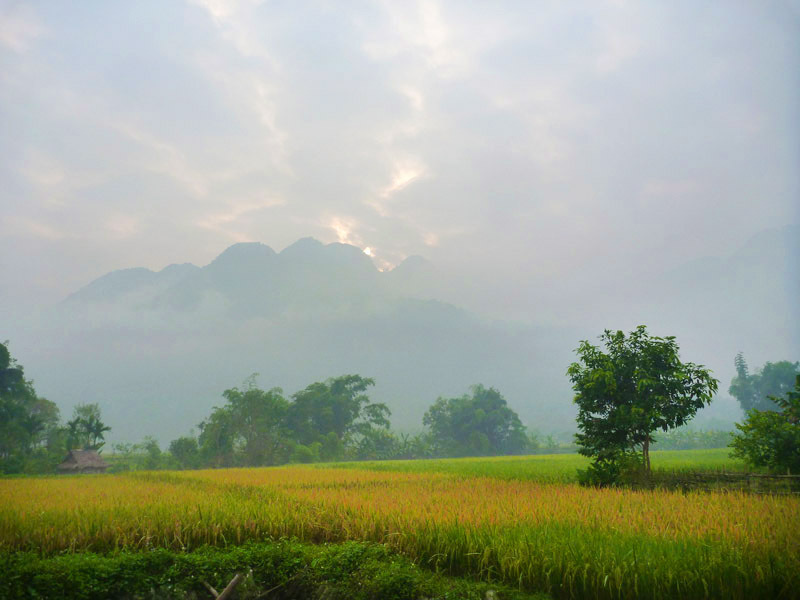 Note the high voltage powerlines taking power from the hydro electric plants near Mai Chau down to the south. 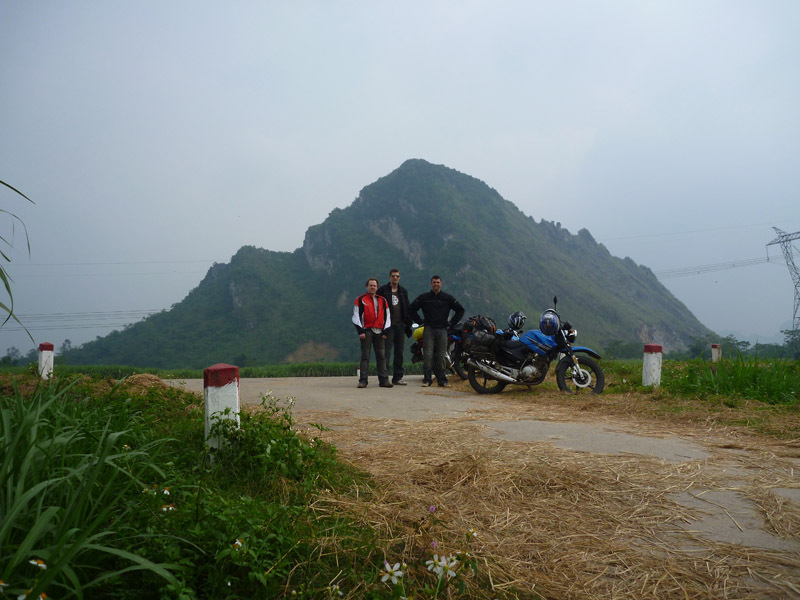 Unfortunately this would also be the afternoon that we would get a stark reminder of the dangers of riding motorbikes in Vietnam. As would happen regularly over the trip we had a few locals, usually young men, who would get a kick out of catching up and flying past us, then slowing down and waving and then taking off doing it all again. On this day we’d been cruising at about 70km/h and had 2 men catch up, have a bit of a wave and then zoom on past. They’d hung out in front of us for about 10km and then on a straight stretch of road pulled away from us. Neither of the guys were wearing helmets and unfortunately they tried to overtake a large group of girls riding home from school and didn’t notice two of them on a scooter trying to turn across the road. In a split second there were bikes thrown through the air and four bodies scattered across the road. Jarrod riding in front witnessed the whole thing and me riding in the middle saw the aftermath of the bikes skidding down the road. Unfortunately at best guess we suspect at least two people died in this accident. We didn’t stop for long as there were plenty of people around and we decided there was very little we could do without speaking the language nor having any medical training. Needless to say we all rode a little more carefully after that. It was also a reminder to always give a courtesy toot of the horn when approaching slower moving bikes or groups of people as often as not they just don’t hear you coming. Still a little shaken we took our time getting the rest of the way to Pho Chau. By about 5pm and after spending nearly 10 hours riding we made it to our destination for the night. 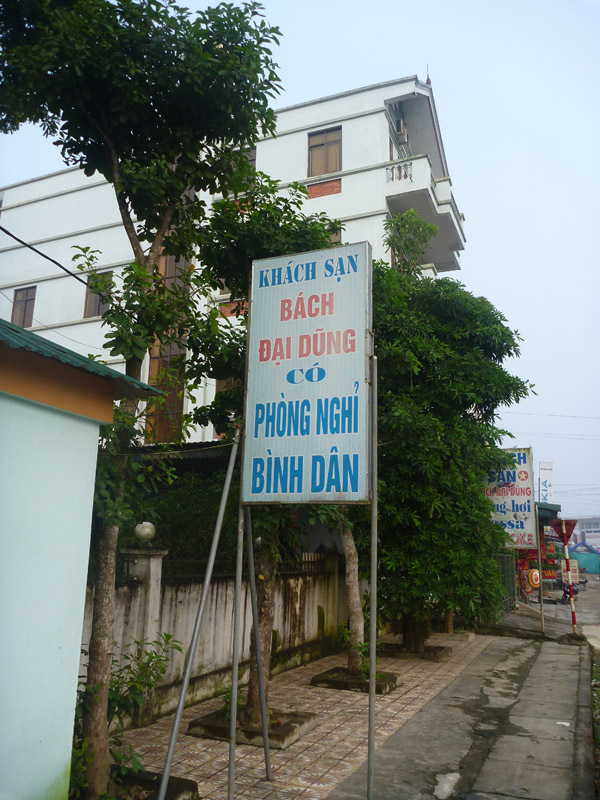 Pho Chau is a quiet little town that consists only of about one main street. Being so far from the tourist havens on the coast there was nothing about this town in Lonely Planet so we were left to find our own accommodation. We spent about 20minutes riding around the town looking for anything that said “hotel” or “guest house” without luck. Eventually we resorted to the phrase book and found the word for hotel “khach” and completed the trip around town again looking for this. Finally after speaking to a local who spoke a bit of english we stumbled across the only hotel in town. For a huge $15 total we got the penthouse suite with three single beds (and wifi) and settled in for the night. I’m sure we were the only guests staying in the hotel that night. 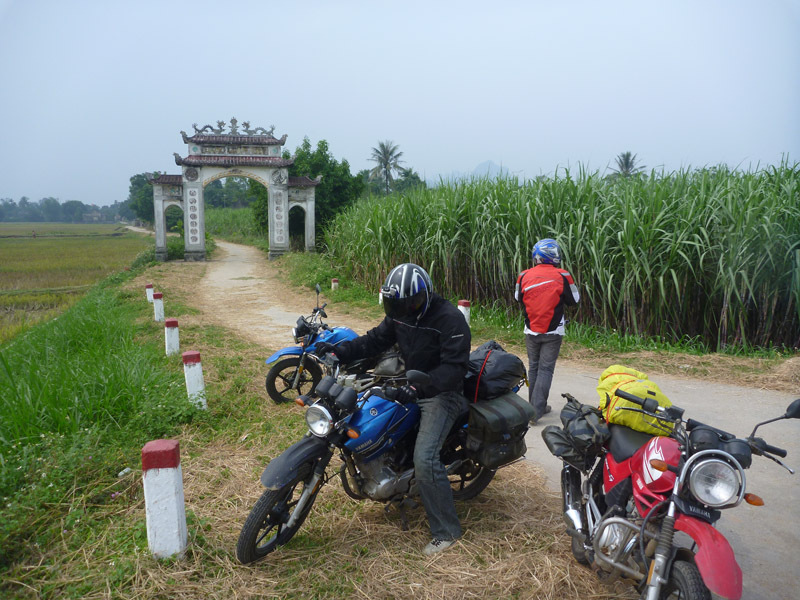 Having realised just how long and tiring a ride 330kms is in Vietnam we grabbed a couple of beers and a feed and were ready for bed. We weren’t exactly sure where we were going to the next day but we were all too tired to think about it and resolved to deal with it in the morning.